It was a banner year for South Florida commercial real estate in 2015. Most sectors had their highest transaction volumes since the economy resumed growing. Property values have returned to – and in some areas surpassed – their pre-recession highs. That gave the Business Journal plenty of deals to pick from when selecting the most impactful transactions of the year. CBRE provided research for the leases mentioned in this section. With more than 16 deals of at least $100 million in South Florida last year and many projects announced, there was a wide variety to choose from for our Deals of the Year. These 10 are our picks for those that caused the most ripples in the market. No. 1: United Technologies Corp.
United Technologies Corp. announced plans to build the Center for Intelligent Buildings in Palm Beach Gardens, creating at least 450 high-paying jobs. UTC subsidiary Carrier Corp. paid Kolter Group $17.25 million for the 30-acre site just south of Donald Ross Road near Interstate 95. It plans to invest $115 million in the 250,000-square-foot facility, which would host a worldwide showcase for advanced building products such as security systems, elevators and air conditioning. Palm Beach County officials estimated the project would have an economic impact of $662 million over five years. The project could receive up to $10.56 million in local and state incentives. Allianz Real Estate of America paid $374.5 million for a 49 percent interest in the Waterford at Blue Lagoon corporate park in Miami, with TIAA-CREF remaining the majority owner. Plans for a 250,000-square-foot speculative office building were subsequently announced, followed by plans for Burger King’s new 150,000-square-foot headquarters building. Playa Retail Investments, led by billionaire Amancio Ortega Gaon, bought a block of South Beach’s famed pedestrian mall from Michael Comras and Jonathan Fryd for a combined $370 million. 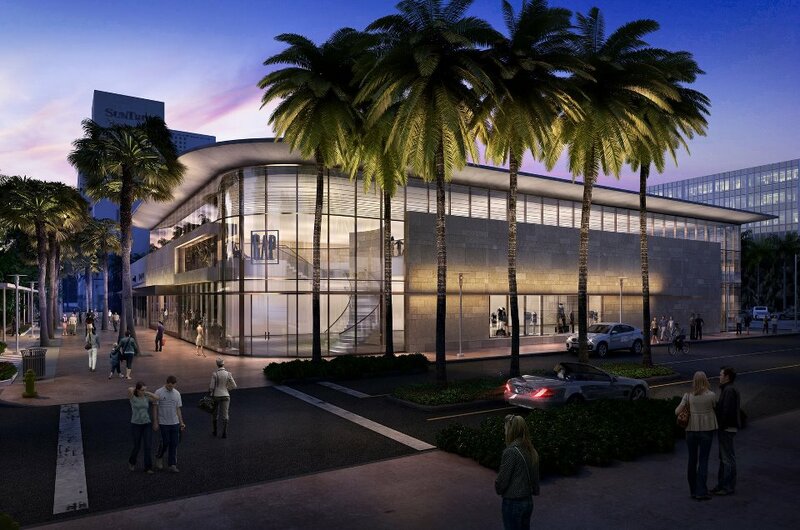 Located at 1001-1035 Lincoln Road, the property has 75,000 square feet of buildings, including the Apple and Nike stores, plus the Gap. It was the largest deal of the year by dollar amount. Chesapeake Lodging Trust paid $278 million for the James Royal Palm Hotel in Miami Beach. Sunstone Hotel Investors and KSL Capital Partners sold the 393-room hotel. Starwood Hotels & Resorts is the franchisor. The 460,000-square-foot Palm Beach Outlets sold for $278.4 million. The seller was the joint venture of New England Development, Eastern Real Estate and Lubert-Adler. The buyer was the joint venture of New England Development and Clarion Partners. Tenants include Saks Fifth Avenue Off Fifth, J. Crew, Ann Taylor, Banana Republic, Nike and Tommy Hilfiger. The largest stand-alone office sale was the $245.5 million purchase of Phillips Point in West Palm Beach by AEW Capital Management. The $546-a-square-foot price obtained by sellers Prudential Real Estate Investors and Colonnade Properties was among the highest ever for a Florida office building. No. 7: 8000 W. Sunrise Blvd. AmSurg signed a 220,000-square-foot lease to relocate and expand its operations in Plantation. It was the largest new office lease of the year. The outsourced physician services firm moved into 167,000 square feet at 8000 W. Sunrise Blvd., and plans to expand by 55,000 square feet in May 2017. The landlord is Toburn Partners. Marriott International sold the Miami Beach Edition hotel to the Abu Dhabi Investment Authority for $230 million. Marriott launched the 294-room hotel in partnership with Ian Schrager in late 2014 after an extensive renovation. At a time when many banks were conservative with lending to developers, Florida East Coast Realty secured a $340 million construction loan for its 83-story Panorama Tower on Brickell Avenue in Miami. Wells Fargo Bank acted as the administrative agent for a group of lenders backing the loan. Panorama Tower will have 208 hotel rooms, 821 apartments, 100,000 square feet of medical offices, 50,000 square feet of retail and 2,300 parking spaces. Once completed, it will be the tallest building in Florida. Aventura Mall nabbed a $213.5 million construction loan for its 315,000-square-foot expansion. JPMorgan Chase Bank was the lead lender. The expansion will include larger retail spaces, a new food court, more restaurants and a VIP lounge. The mall, majority-owned by Turnberry Associates, is already Florida’s largest, at 2.7 million square feet. • In the region’s biggest apartment sale, the Related Group sold the Manor at Flagler Village apartments in Fort Lauderdale for $148.9 million to TIAA-CREF. • The Brickell Arch (formerly Espirito Santo Plaza) office tower in Miami was acquired for $142 million by Gaedeke Group. • Magic Leap signed a 50,000-square-foot lease at 8000 W. Sunrise Blvd. in Plantation. • For the region’s biggest industrial lease, Synergy Custom Fixtures signed a 310,530-square-foot lease for industrial space at 213 S.E. 10th Ave. in Hialeah. • For the region’s biggest retail lease, Walmart leased 182,000 square feet for a store at 3200 N.W. 79th St. in Miami.